As a sales guy, my relationship with my phone is truly love/hate. Don’t get me wrong, nothing is better than making a call and getting the buyer to pick up so you can finally get a straight answer, but the reality is they rarely pick up! In fact, 97% of phone calls go to voicemail and according to InsideSales.com, the average voicemail response rate is 4.8%. The odds are not in our favor. Let’s face it, people hate unsolicited calls, that’s why you get the voicemail to begin with. And why would you expect the buyer to respond if they never even listen to what you have to say? Sales leaders are always looking to increase call time with their reps, but we think there’s a better way than just cold calling. Email is great because it’s less intrusive than a cold call, but how do you make an email personal and human? The answer is Video! 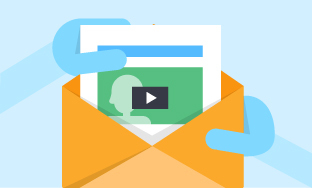 Video makes your email stand out and provides an opportunity for you to be remembered. Furthermore, video engagement can be tracked, so you can actually KNOW if the message was heard, something you don’t get with voicemails. So our recommendation is to use phone, email and video together. Instead of leaving a voicemail, record a generic video (leveraging your existing voicemail script). Then when you make the call, if no one picks up, send a video email instead. You’ll be happy with the results. OneMob is excited to sponsor Inman Connect, a 4-day conference that brings together the best of real estate and technology in New York City later this month. Produced by Inman, the leading source for real estate news and technology, the event will feature some of the biggest names in the industry to discuss the future of real estate and the latest trends in sales, marketing and customer outreach. 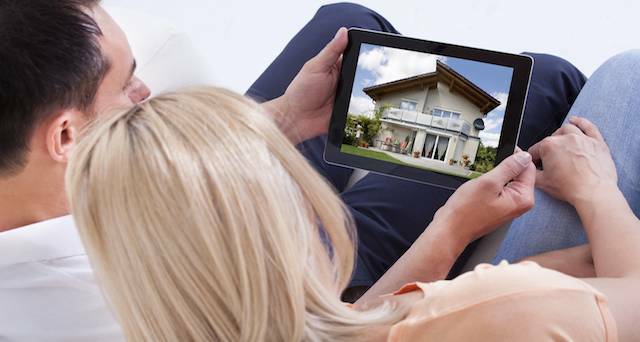 OneMob will be there to show real estate agents how they can sell more properties with video. With the OneMob platform, brokers and agents can record or upload videos of listing, send to clients and then track engagement. Instead of sending YouTube videos, agents can build a custom video player page tailored to their clients, which are fully branded and trackable. Companies such as RE/MAX, Wells Fargo, and Meritage Homes use OneMob to leverage video with their clients more effectively. To learn more, read here on Inman, or visit www.onemob.com to get started. 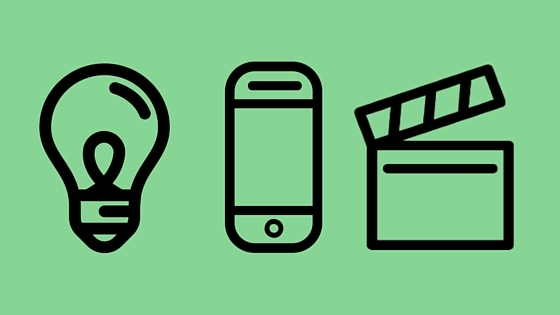 Marketing gurus predicted 2015 to be the year of video marketing, and they were right. With 96% of B2B marketers using video in their marketing strategy, video has proven to be the most engaging form of content. So engaging, that it has made it’s way into email marketing, content marketing, social SEO and demand-generation programs to help marketers improve results, increase brand awareness and strengthen customer relationships. But video is not just for marketers. Quickly catching on in the sales, customer success, support and human resources sectors, the momentum behind video is quickly picking up in 2016. So if you aren’t using video now, you sure as hell should be. Here are 3 reasons why you need to make video a part of your arsenal this year, no matter who you are. With nearly 200 million internet users now consuming online video each day, one thing is obvious- that video is the most engaging form of content. While YouTube has been the long standing dominator of digital video, consumption has extended into social media, with channels like Facebook, Instagram and Snapchat creating their own audiences. That’s why in 2015 we saw Facebook hit 8 billion daily video views and Snapchat earn another 6 billion views. With each platform racing to innovate with new ad formats and attractive features, video is now omnipresent in our digital experience. Regardless of the nature of their content; whether they be high quality productions or personally recorded messages, video is clearly capturing audience’s attentions. To no surprise, video has made its way into the world of B2B, with 93% of marketers using video for online marketing, sales or communication. Not only is visual content more engaging, but it’s provenly profitable- in fact, 52% of marketing professionals worldwide name video as the type of content with best ROI. But the success isn’t limited to marketing, as video is quickly becoming an instrumental part in sales and customer experience in 2016. In very recent years, we’ve seen social media take its place in the sales space. Twitter and LinkedIn have proven valuable for sales reps to connect in non-traditional ways; cue the typical break in scenario in which the sales rep finds that he and his prospect share the same alma mater. While those channels help to facilitate a connection before the first email is sent, the opportunity to share diverse forms of content is even more prominent. 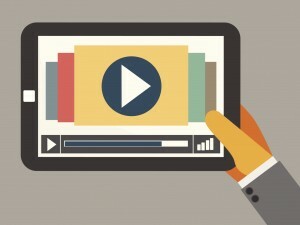 Call it “sales enablement 4.0” or whatever you want, but in the next wave of social selling, video will be a major game changer by increasing the value of your content and your efforts. This is already underway, with 56% of B2B sellers indicating that sales results have been positively impacted by using video. With buyers gaining more autonomy and knowledge of a product on their own, buying on complete viewability will become the norm in 2016. Buyers will make decisions based on their knowledge and perception of not only a company’s product, but of their experience with it as well. Take Uber for example. Instead of taking a taxi, most people now would rather wait longer for their car to arrive and even pay more. Why? Because they know what their experience and transaction will be like based on previous experiences, and are willing to pay for convenience. In fact, 55% of customers would pay extra to guarantee better service. This knowledge has become a major motivation, with Gartner predicting that 89% of companies will compete mainly on experience, and that the experience itself is now part of decision-making criteria. So how can companies best capture this experience, and be sure that they are delivering a seamless one to their prospects and clients? How can they be better at answering questions, offering support, on boarding, etc? When it comes to making a choice, what will make customers think about their experience with you and your product? Video will help deliver that great customer experience and ultimately build relationships, reminding clients why they want to keep coming back, year after year. In the past, the majority of brands looked to free sites like YouTube and Vimeo to host their digital content. We’ve cautioned against this for a few reasons, the first being that these free hosting sites are impersonal. YouTube is better suited to entertain the masses, not to deliver an individual message. Remember what we said about the importance of providing an optimal customer experience? The same idea applies when watching and interacting with a video. 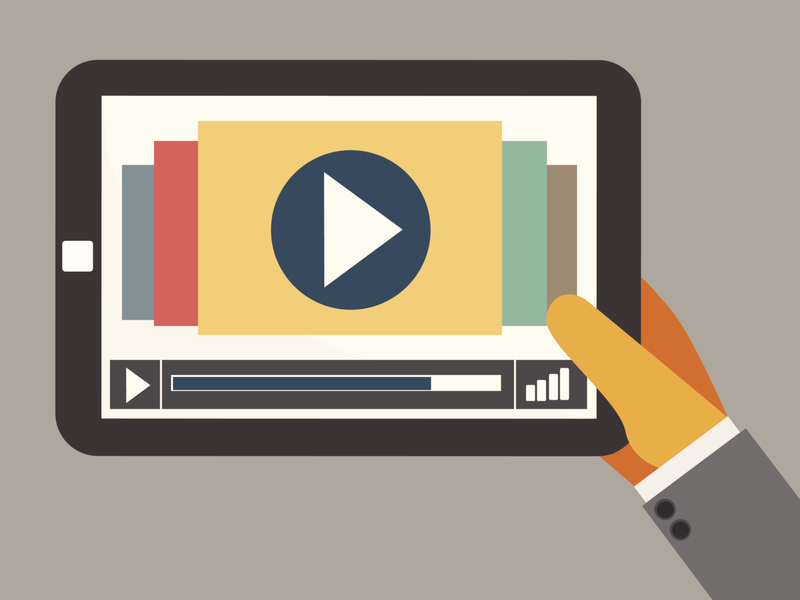 The type of video doesn’t matter- the medium itself has already proven effective. What matters now is the viewing experience. When you turn your digital assets to Youtube, all control on your end is vanquished. Unsupported content, comments and the inability to add additional content make it more of an open forum then a one-on-one conversation. Even when hosted privately, the only data that is supplied to you is the number views or watches, which is why Marketing professionals predicted 2016 to be the year that “views” becomes an irrelevant statistic. While the use of video for B2B sales and marketing is prevalent, the inability to accurately measure results, whether it be engagement or ROI, is a major reason why companies struggle to justify making a greater investment in video. Since video has traditionally been used in content marketing and generating brand awareness, measuring the actual ROI that video marketing efforts deliver has been cited as the biggest challenge by marketers. But with 73% of marketers saying video has positively impacted their results, and another 56% seeing the impact in sales, the benefits are undeniable. Ultimately, what we need to know is not how many watches our videos are getting, but if those videos are actually helping close deals and make renewals. In 2015, we saw the influence of online video skyrocket, both in our personal and professional lives. Video found crazy success in marketing, with sales and customer support quickly catching up. No, we’re not saying that reps are going to start Snapchatting their prospects in 2016, but even that doesn’t sound entirely impossible. While we looked to video to help us engage in 2015, 2016 will be the year where we’ll measure engagement, and its impact on our business. And as video’s influence continues to grow in the coming years, professionals will look beyond the content itself, and into the experience surrounding it. With these ideas in mind; engaging with video, creating optimal user experiences and measuring analytics, businesses will look beyond free video hosting sites to maintain their digital assets. With OneMob, reps can host, distribute and track all their videos with complete control. So stop turning over your video assets to the Wild Web, and contact us to see how you can control the way you connect. What’s one of the biggest problems in sales outreach? According to Winning by Design’s founder Jacco Van Der Kooij and OneMob’s Devin Reed, it’s breaking through the noise. Today’s buyers are overwhelmed with the spamming of meaningless information by unskilled “professionals” faking that they know you, faking that they care and faking that they can offer valuable insights. The result of this email onslaught is that your prospects have become accustomed to ignoring you. But not all hope is lost. In this video, Devin and Jacco show how you can incorporate insightful video into your outreach approach to stand out both professionally and personally, all the while having fun. You can read the full article here to learn more sales strategies from Winning by Design, which helps design, build and scale sales teams for SaaS organizations. 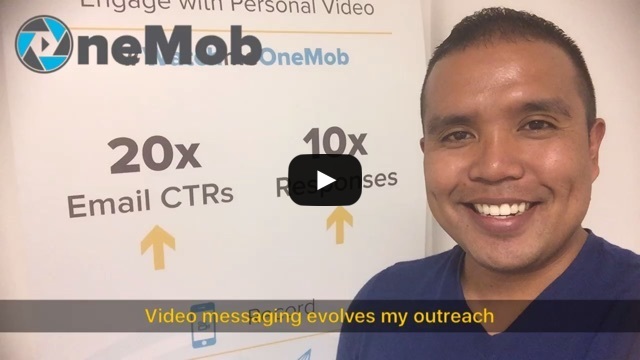 Together with OneMob’s video messaging platform, the two have made a powerful case with video to improve your outreach. Contact us to get started with video messaging today. We’re rolling out many a new feature here at OneMob, and just in time for the holiday season. Here’s a gift that never stops giving – the ability to search and star. When you log into your OneMob dashboard from the web app, you’ll notice things look a little different. In addition to creating editable player pagers, users now have the ability to search for videos by title and star their favorite uploads. This way, when you’re ready to send, all your favorite videos are in one place for fast and easy access. Because we’re more than a just place to create and send personal videos. From training tutorials, marketing materials, product demos and beyond, OneMob is the one-stop shop to host and share all your videos, outside and inside your organization. 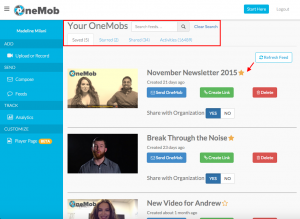 To start searching and starring your videos, log into your OneMob account now. To start storing and sending videos with OneMob, contact us. Cold calling. You’ve done it a million times, and will probably do so a million more. But we keep hearing same the questions pop up in trending sales discussions and articles everywhere. Is it effective or is it outdated? Will we ever move away from it? Is there a better method? A practice endangered to extinction, social sellers everywhere are pronouncing cold calling nearly dead. With so much back and forth, what’s a salesperson to do? The answer isn’t to stop cold calling- it’s to stop leaving voicemails. As every salesperson knows, making initial contact is the hardest part. Picking up the phone has long been the first step in this process. If someone answers your call, great. But when you’re sent straight to voicemail, that’s where things start to go downhill. It used to take about three to four calls to reach a prospect. Given our increased mobility and new modes of communication, the number of attempts has doubled. On average, less than 1% of calls get returned and less than 2% of those calls result in booked meetings. So what does this mean? It means that there’s a fundamental hole in the way sales teams are reaching out to prospects. 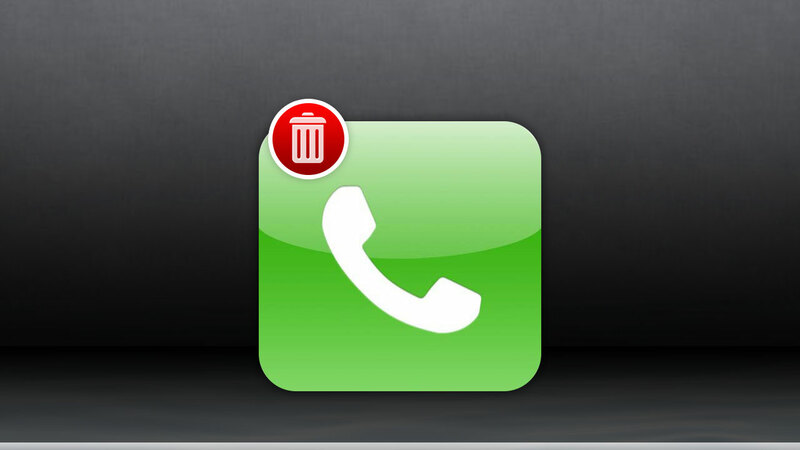 Simply put, leaving voicemails is no longer very effective. We’ve all been in the situation where, upon seeing a missed call and voicemail from a friend or relative, you choose to call back without listening to the message. “Did you get my message?” they ask. “No,” you reply, “but I saw that you called.” Unfortunately, the business world doesn’t operate in the same way, and your prospect is not going to call you right back. According to Business Insider only 33% of people listen to voicemails from business contacts daily, and only 18% listen to voicemails from numbers they don’t recognize. Meaning, four out of five of your cold voicemails aren’t even being played. I’m not suggesting that you put down the phone indefinitely. Real-time verbal communication is absolutely essential. But when you do get sent to voicemail dungeon, you need to be more strategic with your follow up. As evidenced by text and email, much of our communication has evolved from verbal to visual. InsideSales reported that the top three forms of messaging that people respond to are email, office phone calls and cell phone calls. Clearly, people are choosing their email inboxes over their voicemail boxes. But even those are becoming inundated with mass amounts of generic messaging. As text becomes less compelling, what is the next medium that will catch, and hold, our attention? It’s time to take a step back and re-examine our methods. Don’t let an unreturned voicemail slow down your sales cycle. Following up with email is still more effective, but even those can get lost in the mix. So how can you ensure your emails are not only being read, but eliciting more and higher quality responses? Putting a face to a name goes a long way. When someone sees a smile and hears a voice, a sense of trust and a layer of objectivity is established around that individual and their context. Not like in an email, where a text-based barrier makes it difficult to accurately express yourself in letters, fonts and whitespace. And more often than not, your messages are being misinterpreted. With video, this is unmistakable. You’re essentially unmasking yourself and gaining more credibility with your viewers. People don’t want to be sold to. Buyers want to be engaged on their own time, in a new way that’s more dynamic, less about products and more about their business application. They’ve gathered enough information on their own to form an educated opinion. What they need is an expert, trusted advisor and source of guidance. So how are you going to elevate yourself, get more attention and receive more responses? By personalizing your outreach. Thankfully, we live in an age where new tools and technologies are making communication easier, more engaging and enjoyable. Video messaging allows people to record, send, watch and reply to each other whenever and wherever it’s convenient for them. Technology has advanced enough to the point where we’re not limited to recording videos on our webcams and uploading them to YouTube. Nor are we required to own expensive DSLRs to record high-quality videos. Look no further than to your smartphones. You use it every day, in x amount of ways. The practice of moving the phone from the ear to the front of the face is becoming less of a novelty, and more of a norm. At OneMob, we practice what we preach. By incorporating video into our email outreach, we’ve seen increases in our open rates, click-through rates and higher quality responses. See how our customers are getting results with video messaging and contact us to learn more. At OneMob, we believe in tailoring every aspect of your outreach to your brand’s liking. That’s why we’ve brought you branded videos, branded player pages and finally, branded URLs! Not only does this let your brand shine, but creates a more secure experience for your customers because now they know they are visiting a destination they can trust. And trust is our top priority! Now when your customers watch your video messages, you can choose to include your company name in the URL, allowing you to truly own your page and the total viewing experience. 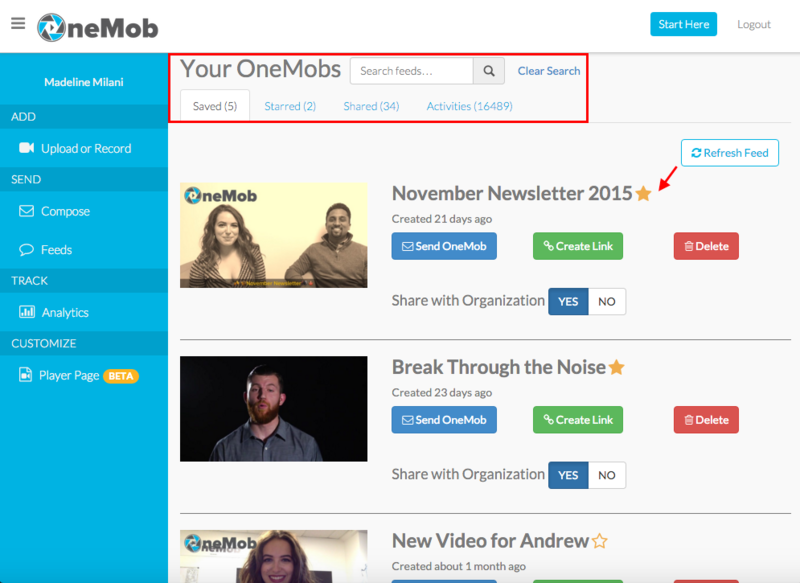 Contact us to learn more, or send an email to sales@onemob.com to activate your branded URL today! OneMob Head of Sales, Randy Yabes, has been in the B2B sales game for 15 years. Here’s how video messaging helps him perfect his outreach and ultimately close more deals. The B2B landscape is continually changing. Since the 2000s, we’ve seen the birth of social media, smart phones and SaaS. We’ve also seen the decline or end of the flip phones, rolodexes, fax machines and mostly everything dealing with paper. In order to succeed, you have to adapt. Call it survival of the fittest. Today, sales orgs are inundated with new tools for sales enablement on the daily. Seasoned reps stick to the tried and true since they know what works. But there are some unique ways out there to stand out from the noise. These ideas aren’t only applicable to progressive millennials, and shouldn’t be ignored. Every rep has their preferred methodology, and my new outreach method is video. Here are 5 ways that implementing video in my sales methodology has helped me adapt, break in, form lasting relationships and ultimately close deals. Cold calling is monotonous and energy draining. It’s awkward, impersonal and often inconvenient for the person on the other end of the line. Reaching out via video is a successfully proven alternative. In this on demand age, sellers need to understand that buyers want to buy on their own time, so why not present information in a way that they can receive whenever they want? Video allows you not only to pitch your product, but really yourself- as a professional, an adviser and as a personality. The tone in your speech affects people’s perception, instantly. Many times, sellers forget what the experience is like for the buyer. Reps are so concerned with delivering the pitch so perfectly that they forget to ask enough questions and really learn about the buyer and their needs. During the middle of a sales cycle, I use video to re-state the purpose of our partnership. Summarizing gets all parties on the same page. Can I do this via email? Probably. But there is no “empathy” font. There is no “insert joke” button (and no, emojis don’t count). Video allows me to deliver a message in a way that says I am here to help, but in a more personal way than text. Stop treating deals like transactions and more like relationships. Showing empathy affords you trust and credibility, which is key to maintaining relationships and ultimately closing more deals. Once I’ve established credibility with my contacts, communication becomes much more direct and efficient. You’re guaranteed to get more direct feedback from someone that knows and likes you – even if it is a “no”. I just want to avoid the two statuses that all salespersons dread – “maybe” and “gone dark”. It’s easier to blow off a response or beat around the bush with someone you don’t know on the other end of the line. Video provides that familiarity. Receiving direct feedback and quicker answers unsure that both of our our times aren’t being wasted. Every salesperson has their signature style and approach. After years of practice, it’s comfortable to get stuck in the same, “proven” routine. But remember, we have to adapt. Since the ways in which we buy, sell and communicate are continually advancing, can you truly step back and see if you are caught up with the times? Training to enhance your routine is best done through video. It’s a crystal clear mirror to see how you look and sound. Golfers record their swing to analyze that hitch. Singers record their voices to hear those flat notes. Why don’t sellers record their potentially stagnant presentations? Seeing my pitch forces me to listen to how I present, poking holes in my normal speech and highlighting possible bad habits and making improvements. It also gives me the opportunity to try something new, such as a new line or sign-off. Selling is one of the toughest jobs because your success is instantly measurable, and success is dependent on buyers making decisions that are in your favor. It’s daunting. It’s tough. But remember this; you are the tip of the sword. You are the first impression that your company makes in a partnership. What inspires me about using a video is this statistic alone: that the average person receives 121 emails a day, a number that is still on the rise. Sending a video itself is already entirely fresh approach to initiating those new conversations and fostering communication. I’m confident and optimistic knowing that I’m delivering something unique from other sales reps because I’m reaching out in a way that’s sincere, unexpected and engaging. The positive feedback that I get from prospects affirms this. About the Author: Since the early 2000s Randy Yabes has been tasked with building pipelines, growing sales teams and developing structures for companies like Staples, IDG, Extole, Experian Information Solutions, and now OneMob. Connect with him on LinkedIn to see how he’s adapted in the SaaS sales world at startup’s and the Fortune 500’s. Cut to the chase. Our attention spans are short, so you have a limited amount of words and time to catch and keep someone’s attention. A simple message, without too many ideas and directions, is the easiest to remember. People expect lame emails and pitches. What they don’t expect is a sharp subject line, a funny GIF or a dynamic video- and those are what stick out. Be counter-intuitive and send something unexpected. Forget the technical jargon, product features and bulleted statistics. Images and videos bring an email to life and encourage engagement. Visual content is substantial, and can translate an idea or experience instantly into a memorable and meaningful concept. With consistency comes credibility. Sending current and relevant content on a regular basis builds up your integrity with customers, and will make them more likely to pay attention to and engage with your content. A successful company doesn’t just sell a product, they sell an experience. In the B2B space, it’s buying into relationships as well, which are formed through discovering mutual commonalities and connections and take time to nurture. It’s not enough to communicate and engage through text. Step up your messaging with engaging content in a dynamic format that will truly resonate. Relating to my previous point, emotional appeals increase engagement and build rapport. Creating a narrative around your brand captures these emotions and experiences, and takes your viewer on a journey. Make your story about the customer and tailor the information to the individual. This will encourage not only reaction, but action as well. There are many mediums out there that can capture these ideas, but only one is capable of embodying all five- and it’s video. Video puts a live face to the name, connects sounds and visuals to the story and triggers emotional reactions through the senses. A dynamic video will inform and engage your audience, keeping relationships strong through the entire customer lifecycle. It doesn’t require a lot of time or resources either. There are a number of video platforms that you could choose as your host, but only OneMob gives you the tracking, analytics and freedom of mobility. 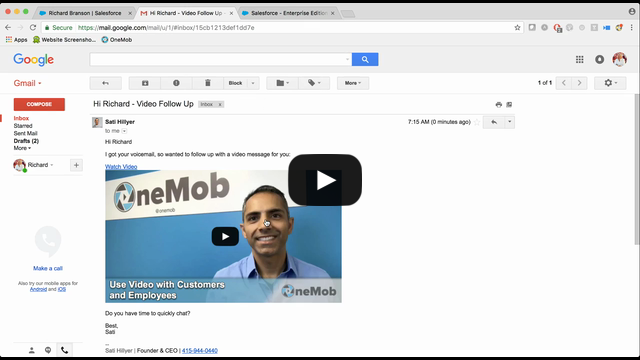 For tips on how to improve your emails and examples of video use cases, check out our support page.